The Traveling Suitcase is a 3-piece rock outfit from Oshkosh, WI. 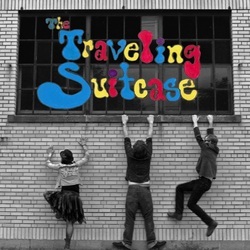 Starting in 2010, the Suitcase has been unpacking all over the country having toured to Seattle, Nashville, Colorado, and all over the Midwest. Their musical amalgamation slams their listeners into a world of medicinal bass lines, teeth whitening guitar solos, and ecstatic songs that awaken our inner child. Those fortunate enough to experience a Traveling Suitcase performance are sure to come back again for another listen, and then another, for the band excels in bringing large groups of people back in line with reality. Drawing influence from the musical styling’s of The Doors, Led Zeppelin, and My Morning Jacket; Traveling Suitcase creates a landscape of dominate independent rock and roll. Breaking loose from tradition, lead singer/drummer Nicole Rae is sparked with emotion, animation and discipline. Rae's voice and lyrics are captivating while the band collectively compliments each performance. Blending music from every corner of time and style, Suitcase packs authenticity. If the band had to be summed up in one word, it would be grooverockatronalonothon.